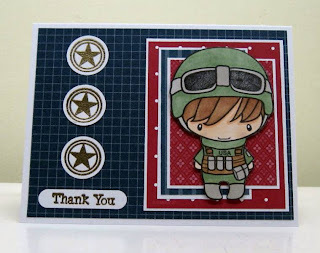 It's about time that Rox71 was chosen as the Featured Stamper on SCS. She hosts the Sketch Challenge every Wednesday and is a marvelous stamper. Here are the two cards I CASEd from her gallery. I had to do a second card. I actually combined two of her cards this time. This one and this one. The sketches were similar, and I combined the butterflies from the Dots card with the shape of the squares in the Flowers and Hearts one. My images are all from an Inkadinkadoo set of butterflies/birds inchies. 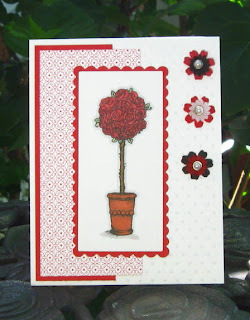 I’m still playing along with the Stampin’ Out Alzheimers challenges. Tomorrow is the last day of the marathon. To play along each person had to donate at least $5.00, with all proceeds going to the Alzheimers Association. The goal for this week-long challenge was to raise $5,000. As I type this, $6,085 has been raised. Here are two more cards I made this week. The first was for the Clear Card Challenge. 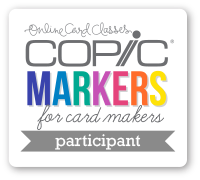 The image was stamped on white cardstock and then colored using a combination of Copic and Prismacolor markers. After masking the rose, I stamped some leaves in Mellow Moss, added some texture using Itty Bitty Backgrounds, and then sponged around the edges. The sentiment is from Savvy Stamps. My clear cardstock is folded over about ¾ inch to the back and then attached with redline tape. 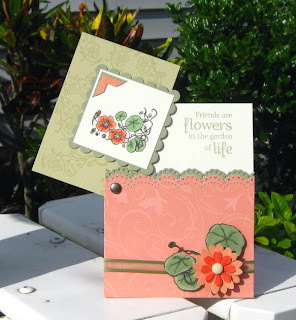 The two flowers attached at the bottom corner are Sizzix Embosslits from SU. The second card was a sketch challenge. 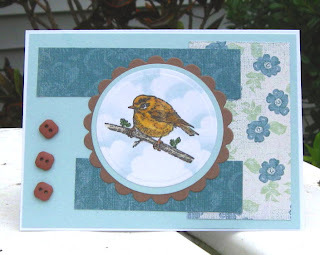 After stamping the bird image, I masked it and made the clouds using a scallop circle and sponges. I was able to use a scrap of some two-sided DP for the small panels and added the buttons. 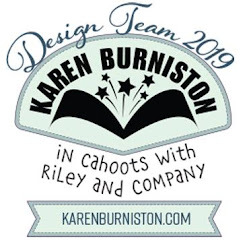 The hostess for this week's Stampin'Bs Design Team Challenge was NancyRuth. 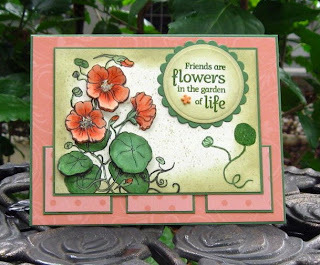 I couldn’t wait to use the new Flourishes set called Nasturtiums, and NancyRuth’s challenge to use flowers on our cards was the perfect place. In searching the internet for photos of nasturtiums, I found that they come in shades of yellows, oranges, and reds. 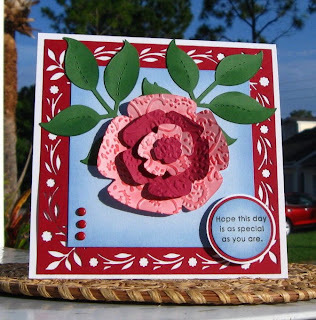 One of my favorite (retired) In Colors from Stampin’ Up is Groovy Guava. I’ve got a stash that I try to use sparingly so it will last. So I used some of the GG designer series papers for the background and also on the three small squares. All matting is done in Garden Green.The image is stamped on Very Vanilla with Palette Noir Black and colored with Copic and Prismacolor markers, with the exception of the small ones in the right-hand corner, which were stamped with Garden Green pigment ink and embossed. To carry the “flowers” challenge even further, I used the sentiment from the same set and cut it out with some Nestabilities. 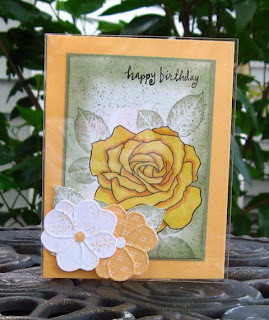 The background is stamped with Itty Bitty Backgrounds and sponged with River Rock. To add some texture, I popped up the flowers and two of the leaves, adding a little Stickles to the centers of the front-facing blooms. 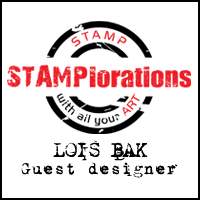 If you'd like to play along with us, stop over at the Stampin'Bs Design Team Challenge Blog. 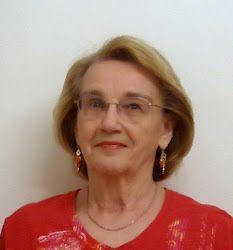 I've been participating in the Stampin' Out Alzheimers challenges this week. My mom has been diagnosed with possible Alzheimers, so I had another reason (besides loving to stamp) to participate. Here are a couple of the cards I've made. The challenge for this card was to use buttons. This PaperTreyInk set is called Guidelines and has many different patterns you can stamp within the gridlines to create a quilt-like pattern. I thought the sentiment from My Sentiments Exactly was a perfect match. 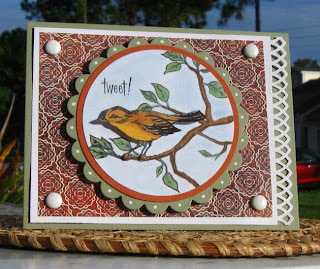 This card was made for Paper Makeup Stamps' "Any Winged Thing" challenge. 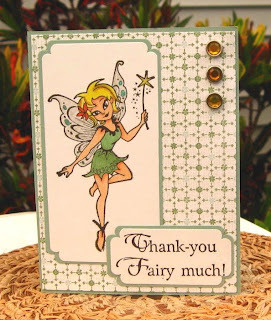 I don't have any PMS stamps, so I had to "wing" it with one of the fairies in the Beautiful Fairies set from Inkadinkadoo. 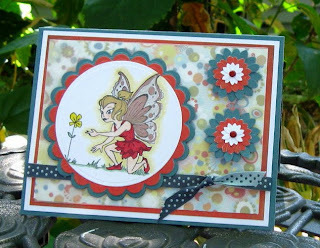 I had used another fairy from this set in SCS's Featured Stamper challenge a couple weeks ago. The card base and mat pieces are Sage Shadow, which I think is a very pretty shade of green. I found the sentiment stamp at StampFest last year. It's from Custer's Last Stamp. I had never tried a Hinge Card until I saw the Technique Lover's Challenge this morning. I watched Wendy Weixler's video tutorial then plunged right in. The image is the small group of flowers in Flourishes' new Nastutiums set. I colored it with Copic markers and then added the photo corner punches, layered SU and EK Success. 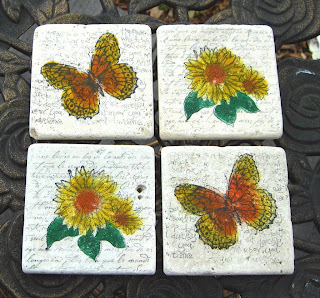 The River Rock hinged piece is stamped in Versamark with another image from the Nasturtiums set. While the punched out flowers are definitely not nasturtiums, I colored them the same as the printed image and backed them with some nasturtium leaves cut from the large image. The inside is stamped with the sentiment from the same set. 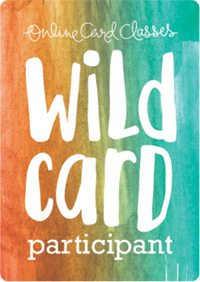 I made two cards for Joanne’s challenge. My first card uses a Martha Stewart border punch down the side. I cut out the bird from Flourishes’ Home Tweet Home set, popped him up on the branch, and set him in a Nestabilities circle. The four white brads stand out nicely against the Basic Grey Boxer DP. 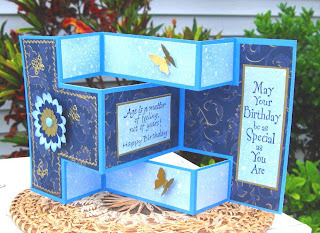 My second card has lots of sponging – on the Sizzix die cuts of leaves and flowers, and also on the blue background panel. 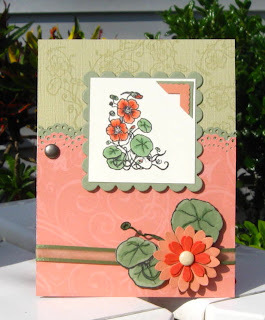 I am enjoying this new Fiskars corner and border punch, which goes all the way around the outside of my card. 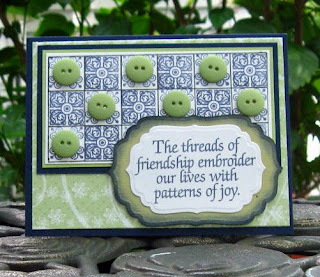 The sentiment, which is from PaperTreyInk’s Birthday Basics is in the popped-up circles. And I got the required brads in, too. I know it's not Tuesday; but it's been raining for three days, and I've been having lighting issues with my camera. Flourishes Timeless Tuesday Challenge this week was to make a square card. One of my favorite Flourishes sets is I Love Roses. I can’t grow roses, so stamping them is the next best thing. I took the square sketch from SCS’s Sketch Challenge 207 and used it as my layout. The images from I Love Roses were colored with Copic markers and cut out. The DP is from Basic Grey's Sultry DP. The large center panel is sponged with Regal Rose, and I added a couple of dabs of Crystal Effects to look like dew (or rain, if you’ve been in Florida for the past few days) on the rose petals. 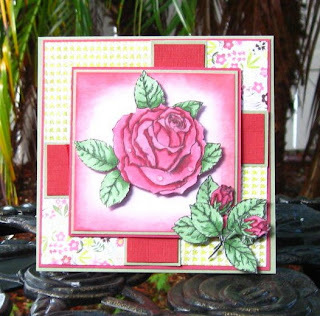 Several weeks ago on Stamp TV, Gina K demonstrated how to make coasters using 4- inch square tumbled tiles. According to her video, you don’t have to heat set the ink or spray fixative on it. I got my tiles at Home Depot for a good price – nine tiles for less than $5.00. Make sure you get tiles that are unglazed because I found that out the hard way! I stamped French Script with Black StazOn ink on the tiles and sanded them to make the words quite light. 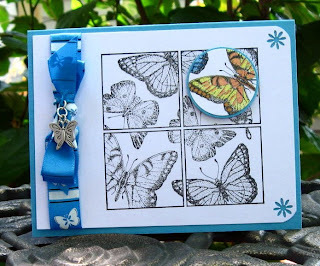 Then I stamped the butterfly and sunflowers. 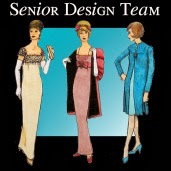 Using sponge daubers, I colored in the images with StazOn Mustard and Pumpkin. To do the leaves on the Sunflowers, I first stamped on a Post-It note and cut out a template. Small felt pads on the under side of the coasters keep them from scratching the table. The gift box was made with two clear boxes, cut at four inches, glued together with redline tape. 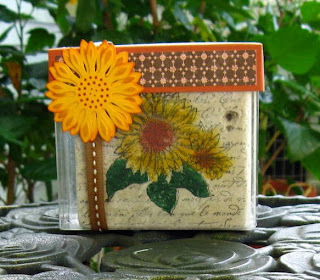 The sunflower die cut embellishment on the ribbon was made with the single sunflower die in the Spellbinders Edgeabilities Sunflower Garden set. Today's Technique Lovers Challenge on Splitcoaststampers was to make a tri-shutter card, a new technique to me. I used two different blue designer papers and some gold stickers on my card. The daisy is made with several layers of punched daisies (Not Quite Navy, Bashful Blue, and Gold), using three different sizes of Marvy Punches. It's hard to see, but I sponged the edges of the Bashful Blue layer on the daisy with Bashful Blue ink. I added a couple of gold butterflies, punched with my Martha Stewart butterfly punch. With Memorial Day right around the corner, I thought I would use today's Sketch Challenge to say thank you to our troops, fighting for freedom in many far-away places. I used several patterns of Real Red and Not Quite Navy, along with white for the patriotic look of this card. I popped Hero Ian up over the sketch and added some gold stars and the sentiment on the side. Hi! I'm Lois Bak. 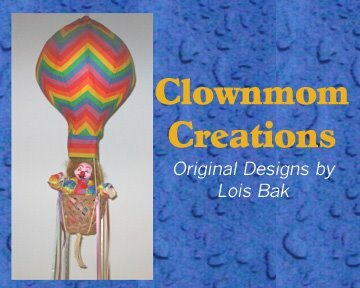 I stamp under the name Clownmom on Splitcoast Stampers. 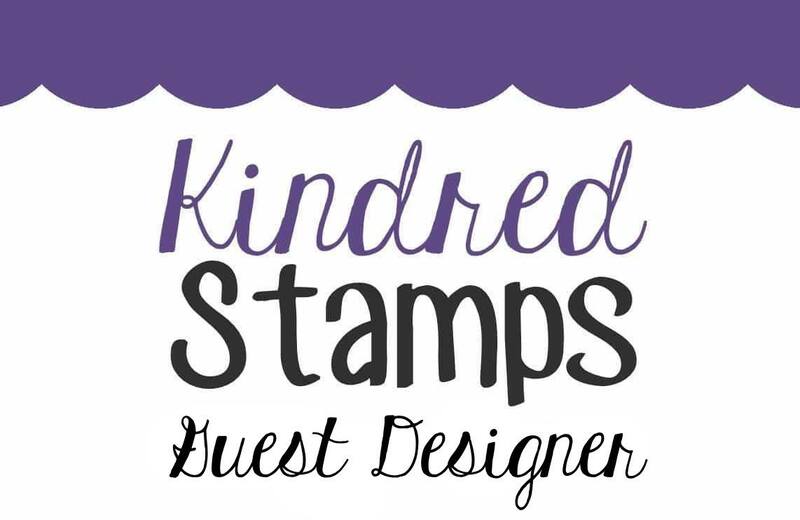 I am a member of the Stampin' B's Design Team. Every Friday, the team presents a challenge to the stamping community. We have a great time! Please feel free to join us! Here is a link to that site. This week's challenge was to make a Spotlighting card. 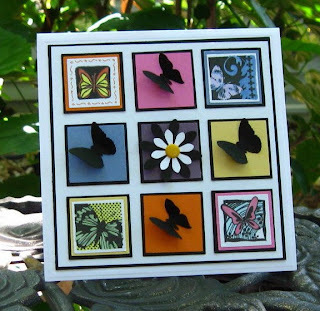 The image is Butterfly Square from Impression Obsession. I colored the spotlighted section with a combination of Prismacolor and Copic markers and popped it up with dimensionals. I added the ribbon and butterfly charm for a little interest and still thought it needed something, so I punched the corners on one side."